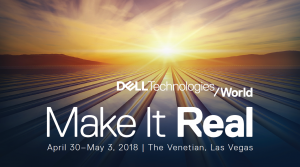 Dell Technologies World is in full swing in Las Vegas this week. There are so many new products and features being announced that it can be hard to keep track of them all. I’ve sifted through all this stuff and come up with a few of the biggest things to come out at this years show. This refresh to the VMAX product line represents the next generation of the enterprise class storage array, complete with all new names for things to keep you on your toes. We are calling the running code “PowerMax OS” now. This new platform is built with end to end NVMe, and is NVMe fabric ready. Starting at 10u in size with 13TB of capacity in that footprint. A lot of the details will seem pretty familiar for vMax users. The PowerMax 2000 is the entry level, one or two brick offering built for up to 1 PB effective capacity and 1.7M IOPS. The PowerMax 8000 is higher end offering with up to 8 engines and 10M IOPS. The platform is built with inline dedupe and compression that works with all data services while promising data reduction in the 5:1 ballpark. This platform will be available on May 7, 2018. XtremIO announces a new native replication that is metadata aware offering high levels of bandwidth efficiency and ease of use. By leveraging the built in data reduction over the wire, only unique data is sent to the remote system, reducing WAN utilization. Since the system is pretty good at data reduction already, there is practically no performance impact to achieve these benefits. The new native replication is configured right inside the XtremIO HTML 5 GUI. I saved the best for last here. There are 2 new rack server offerings, plus a new blade enclosure. The new rack servers are the R840 and R940XA. These are 14th generation servers. The R840 is a quad socket, 2U rack server that can hold up to 26 SSDs or HDDs. You can build it out with 2 GPUs or FPGAs. The R940XA is a quad socket rack server (see above picture) that can hold up to 32 SSDs or HDDs. You can fill it up with 4 GPUs or 8 FPGAs. There is also a new blade enclosure, the MX, which appears positioned to replace the M1000e. It will launch with 14G server offerings and be built to accept several generations of new blades over the coming years. More on this in a dedicated post soon. Did you make it out to Dell Tech World this year? What did you think of the show? Let me know in the comments below.